Submitted by Migrate Wizard on 2014-08-07 06:55. 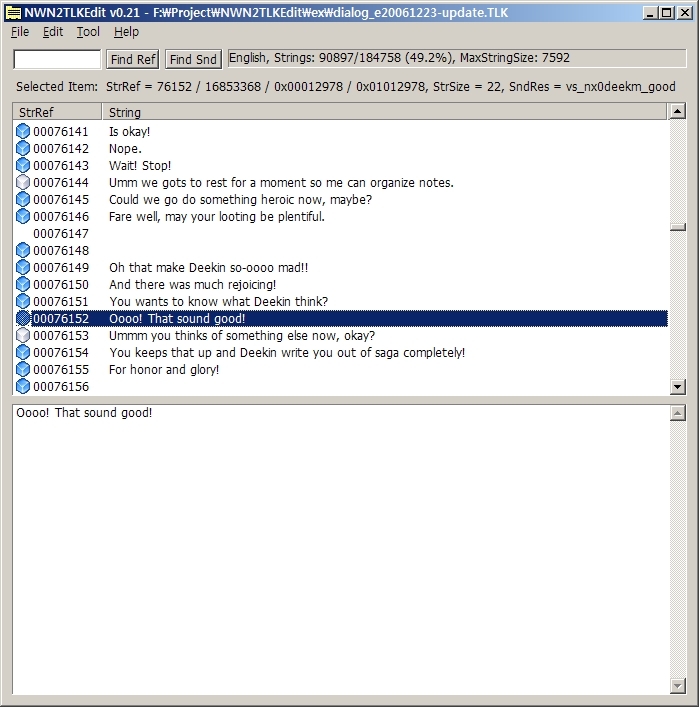 * TLK file is the 'Talk Table' file used by Bioware aurora game engine. * NWN2 uses UTF-8 character set. * If you want to edit TLK file of NWN1, execute NWN1TLKEdit.cmd. * You can build source in Microsoft Visual Studio .NET 2003 environment. * Using this tool and source code is free. 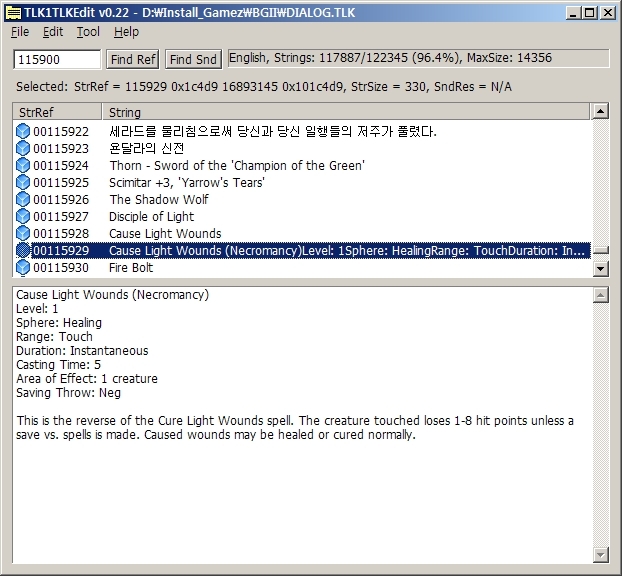 * This tool was written for Korean Translation of NWN2. NWN2 tlk have non-Unicode chars(ex, extend ascii char), therefore you avoid fully export and import. Some contents are not represented to ascii text, so you do use this tool or NWN2Toolset to edit that. ex) 'u' character of "faerun"
1. List and view full contents of tlk. 2. Search by 'StrRef(Unique number for string)' or text. 6. Batch run with '*.txt' file for updating. 7. Extract string contents to '*.txt' file. 8. Redefine the rule for batch text file. - Fixed, 'Find Snd'. if sound is present (flag on) and sndres data is empty, skip ok.
- Fixed, 'Extract Diff String List'. Pre-version extract all items if two are same. - Added, find a item by sound resource ref. if find by empty, will be found a next item that SoundRes is present. This is a good alternative to tlkedit. They each do some things the other doesn't. For me, this one has better handling of long .tlk lines. The limitation is it can only have one .tlk open at a time, while tlkedit can have multiples. The best tlk editor i have found untill now, for NWN1 too!